In the summer of ’69 I served on summer staff at a conference center in the beautiful Ozark Mountains of Missouri. It was a dream job for me. Besides being a general handyman and lifeguard, I was also responsible for summer staff recreation and driving the ski boat. I loved the water, the sun, and the people. As the staff recreation director, I was responsible for planning a weekly event for fun and entertainment. By the third week of the summer, my friends and I had spent some of our free time spelunking in a cave on the property. The cave’s mouth invited curious youths with a longing to explore. Fifty or so yards into the cave, explorers encountered a deterrent that would stop most casual visitors. After many reptilian curves, the cave was reduced to a small opening, from which a stream flowed. The three- to four-foot opening required one to duck-walk through the creek with head bowed. At this point the light from the opening was insufficient and artificial light was needed. Within a few minutes, the cave-trekking became more difficult and messy. To continue, one had to crawl on hands and knees through a shallow stream for a few yards until the opening was impassable. However, as my friends and I continued, we found another way. Apparently, the stream at one time had etched out another passage. The only way forward was on hands and knees through the serpentine muddy path. I’ll never forget the discovery of a rather large room, perhaps 100 yards into the mountain. The roof of the cave rose and the walls broadened to reveal a pool situated next to a large rock. The dripping springs from the ceiling of the room played a constant melody as water hit the pool and then moved on through the room to create the stream through which we had crawled. As I remember it, the room was the size of a one-car garage, but the ceiling was perhaps 15-20 feet high. Sandstone stalagmites and stalactites had developed around the room. We were thrilled! Upon further exploration we found a smaller room adjoining the larger one. This anteroom was about 12 feet above the ground floor. Working together, two people could scale the wall and crawl into the small room, which was about 4 feet by 9 feet. When we first saw the hole in the wall, we wondered if it would be another passage that led deeper into the mountain, but to our dismay, it was a dead end. As we explored the other exits from the room, we discovered eight more paths besides the one by which we had entered. We chose the largest one and walked 100 yards or so. It led to a gratifying discovery – another large room. This one didn’t have a spring or pool, but it was larger with more sandstone formations than the first one. At that point, the paths grew too small to navigate, and we turned around and went back out. At least I thought it was a great idea. I suggested to my friend Sam that we plan a cave exploration party for the summer staff. We would enter the cave at 7 p.m. and lead the staff all the way back to the second room. We should be back by 8:30 p.m. to enjoy a pizza party and share our experiences. We got clearance to have the party, and plans were made. All went as planned until Sam and I decided to draw attention to ourselves. Once the group of 20 or so summer staffers got to the back room, we decided to return ahead of the party to the big room and hide in the anteroom we had discovered. When we heard the group come through the room, we began yelling, “Help!” We wanted to see if they could find us. The plan seemed harmless at the time, but we didn’t take two factors into account. First, it never crossed our minds that they would ignore us. (When they heard us they thought, “There’s Norm and Sam trying to get attention. Let’s leave them and pretend we didn’t hear them”). We also didn’t consider that both of our light sources could fail. But that’s exactly what happened! As soon as we tried to get their attention, my flashlight batteries died. Not to worry. Sam still had his lantern. Once we determined that they had moved on, we decided to abandon our escapade and follow them. I climbed down first, dropping into the soft wet sand. He handed the lantern down to me, and I set it down and reached up to catch his feet in order to help him down. In a moment, we were plunged into the darkest dark there could be. The lantern went out. Once Sam got down, we started screaming in all seriousness, “Help! Help!” but to no avail. Our senses went on alert in an attempt to orient ourselves and form a plan. From our earlier exploration we knew that in the center of the room was the large rock beside the pool, so we moved slowly on hands and knees to the boulder and perched ourselves on top. We first prayed and asked God to have someone come back to get us. Surely they would miss us at the pizza party and return looking for us. In the meantime, we thought we could pass the time quoting Scripture and singing songs, which we did for what seemed like an eternity. I was wearing a sweatshirt, but Sam only had a long sleeve cotton shirt on. The cave has a year-round temperature in the mid-50’s and Sam was getting cold. In addition, he was getting claustrophobic. His attitude deteriorated rapidly at that point, and I thought we had better get on the move. The problem: how would we find our way out? There were 9 exits out of the room and only one of them led out of the mountain. All the rest dead-ended deeper in the darkness. After much prayer, praising God, and singing, we asked God for wisdom. We couldn’t wait for anyone to return. It would be too late for Sam and perhaps me, as well, if we waited much longer. His shivering and claustrophobia were getting the best of him. An idea came to mind. “Follow the patted-down mud out of the room and through the cave.” To do that, we would have to crawl on all fours, but we were going to have to do that anyway. I also knew we could not get separated. So we took our belts off and linked them together. I took the lead and Sam followed. I gathered a little hope when I realized I could feel the tennis shoe marks in the wet sand, but what was I to do when we got to the part where the others had had to go to hands and knees as well, leaving no footprints? All I knew to do was pray and crawl. Numerous times, I hit my head on the roof of the cave and realized I would need to crawl with one hand up, feeling what was above me, and another hand down, feeling for the floor and walls. We ran into two dead ends and had to turn around and work our way back in hopes of finding the only passage out. At one point, I found a torn sweatshirt reeking of perfume, and hope rose in my heart. Sam and I rejoiced and thanked God that He had through His sovereign mercy provided a marker of hope. As we continued crawling, we came to the creek bed and knew we were on the right track. In total darkness, there’s no use for your eyes. You close them. Your brain focuses on what senses are of assistance in those circumstances – touch, smell, and hearing. So when I first experienced the joy of our deliverance, it wasn’t because my eyes detected the light from the street light at the entrance to the cave weaving its way into the darkness. Rather, I noticed a sense of warmth on my face. The moment I felt a slight rise of temperature on my skin, I opened my eyes. I could actually make out the walls of the cave! We didn’t need to crawl any longer. We could stand and run out of the cave. As we exited the cave and stood under the street lamp, we praised God and rejoiced in His mercy toward us. We were finally free from the smothering darkness and fear. We thought we would return to a group of worried camp friends, but that was not what happened. When we looked at our watches, we were shocked. It was 2:30 a.m. We had been in the cave for seven and a half hours! As we made our way up the hill to our dorm, we were asking ourselves why no one came back for us. Everyone was sound asleep. How could this be?! We woke everyone up and asked them why they didn’t come get us. They told us that when we didn’t show up for the pizza party they figured that we were exploring more of the cave. When it was bedtime, they decided not to wait up for us. Why lose sleep over a couple of foolish knuckleheads who don’t know when to come out of the dark? Needless to say, the camp director was not happy about what transpired that night. When we told him the story the next morning, we could tell he was concerned. We could have succumbed to hypothermia or have been lost in unknown passageways in the mountain. Two staffers could have died on his watch. How would that look in the local paper? Within days, the cave was off limits to everyone. Eventually locked gates were installed at the entrance and at the place where one has to crawl through the creek bed. 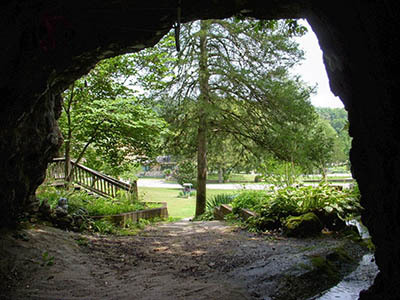 Sidewalks and lights were added years later between the entrance and the last gate so that campers could visit the cave safely. As best I can remember, this was the first time I feared for my life and felt totally helpless. However, I learned through the experience that God was with me in the darkness. That truth has been my anchor, stronghold, and comfort ever since that event, whether the darkness has been physical or spiritual. That night, I cried out to God to give us wisdom and to lead us out of the cave. He did! From the moment the light went out until we ran out of the cave, I was in constant communion and conversation with God, my helper, savior, and deliverer. When circumstances of life seem dark, I have found Him to be the light in the darkness just as He was during those hours of darkness in the cave. God spared my life and brought me out of the darkness. The Apostle Paul wrote to the Colossians, “He has rescued us from the domain of darkness and transferred us into the kingdom of His beloved Son, in whom we have redemption, the forgiveness of sins” (Col. 1:13-14). I have experienced God’s physical and spiritual salvation. At the time of the cave experience, I don’t think that I was converted, but I knew about God and about Jesus’ death on the cross because I had been taught those things from childhood. At the cross, God purchased the right to be with His children for all of their lives, even before He regenerates them through faith by the power of the Holy Spirit. He isn’t with us because we are good, but because Christ died for us even while we were sinners (Rom. 5:8). He writes His story in our lives from our conception to our final breaths. This experience gives me hope to encourage you to teach the gospel early to your children and encourage them to converse with God, going to Him for help at all times, especially in their times of darkness. King David wrote, “Even the darkness is not dark to You, and the night is as bright as the day. Darkness and light are alike to You” (Ps. 139:12). In the darkest moments in life, be comforted that God knows and sees you and the circumstances. “When I am afraid, I will put my trust in You” (Ps. 56:3). That night I found God to be faithful as I trusted Him to guide us out of the darkness. You will find Him to be faithful also as you put your trust in Him. My last thought is this: Darkness is meant to humble us. Anytime we are in spiritual darkness, instead of striving to get out of it in our own strength, it is best to praise God, thank Him for His presence, affirm that He is with us, and then pray, trust, and listen. Let us humble ourselves and seek His face. He alone can bring us out of the darkness, and when He does, it will be for His glory.